Here is another great educational game for younger kids. Students take turns drawing clue cards from the case categories (Synonyms, Antonyms, Homophones, and Multiple-meaning Words), reading the questions aloud, and checking the answers on the backs of the cards with the magnifying glass answer decoder. Super Sleuth Vocabulary is a game where you'll have fun playing it and also learn a whole lot. Help your vocabulary grow learn more about words with this great game. If you have ever played this game, be sure to tell how you liked it or didn't like it. Give us your feed back. Learn more below with the game rules and give this game a try. To be the winner you'll need to be the first detective to earn three badges from each case category and get promoted to Super Sleuth! 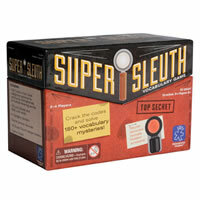 Includes 200 clue cards, 4 category dividers, magnifying glass answer decoder, 48 badge tokens and the official Super Sleuth Vocabulary game rules and instructions. Please keep in mind that the official Super Sleuth Vocabulary childrens rules and instructions could be different depending on the game version you have. The rules below are some of the exact directions on how to play Super Sleuth Vocabulary. Share with us your comments, funny stories, tips, advice, strategies, creative ways to play, questions about how to play, problems with the rules or anything you want about Super Sleuth Vocabulary. All submissions will be reviewed within 24 hours. Click here to add your Super Sleuth Vocabulary comments.